Jabra CLIPPER is the newest addition to Jabra’s Stereo Headset range providing users with wireless stereo music and calls in one cool little Bluetooth® clip. Wireless music and calls on the go Jabra CLIPPER is the newest addition to Jabra’s Stereo Headset range providing users with wireless stereo music and calls in one cool little Bluetooth® clip. Jabra CLIPPER’s in-ear headphones block external noise which enhance its clear, vibrant music and calling quality - leaving you to get lost in your music rather than the outside rumble. However, to make sure you’re still connected to the outside world, Jabra CLIPPER automatically switches between your music and incoming calls to your phone. Plus, to prevent you from dropping out of range or leaving your phone behind Jabra CLIPPER cleverly features a mobile distance alert (within 10 m). The Jabra CLIPPER is compatible with any device with Bluetooth technology and has the ability to connect to two different devices at the same time. 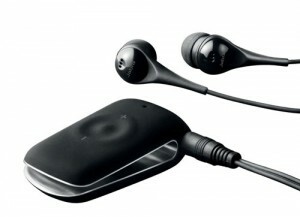 It also comes with a 3.5mm plug so that you can use your own favorite headphones.